Recently my kids have been interested in trying to figure out what a bird is from pictures I’ve taken. Although both have shown some interest in birds over he the past few years, my son Connor has spent much more time paying attention to birds and trying to figure out what they are, so in many cases something that is a challenge for Rowan, he knows immediately. The picture above was one such example, so I had Rowan do this one on her own with a couple of bird books and some prompting questions from me. In what follows, I will explain the process she went through and follow up with a second picture, so if you don’t already recognize the bird and want to try figuring it out on your own, you can check your answer below. The first two things Rowan keyed on were the size and the obvious red-colored under-wings, and the red mustache (malar). With some questions from me, she also noticed the spotted breast/belly and white rump. She did not really have an idea of what group this bird might belong to (though she was clear on some that it did not belong to, such as waterfowl and raptors). She thumbed through the bird book and noticed a dove or two that had reddish looking under-wings, but I asked her about other features, they didn’t match. On a second go through the book, she stopped on Gilded Flicker, but the range did not include our area, and pictures of related flickers were not the best for comparison with the picture she had to identify, so she was about ready to move on when I suggested she use a different bird book, since sometimes they’ll have alternate views which are helpful. With the other book, she was able to conclude this bird was a Northern Flicker. 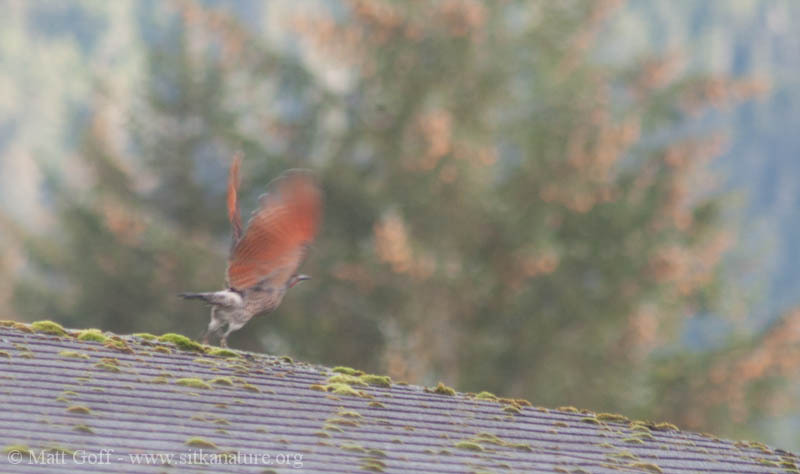 When we discussed whether it was Red-shafted or Yellow-shafted (the range of each showing possible presence in Southeast Alaska), the most obvious call is Red-shafted due to the red shafts on its wing feathers. However, looking at the picture below, the bird had a red nape crescent, which is supposed to be a characteristic of Yellow-shafted birds. 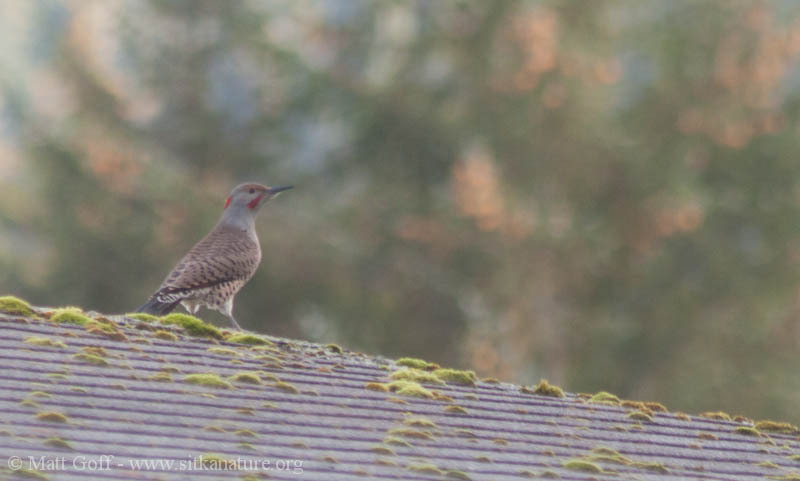 I explained that the two types can interbreed and have mixed up characters, and that has pretty much been the case with every flicker I’ve seen so far around Sitka. This entry was posted in birds, identification, kids and nature and tagged birds, Quiz. Bookmark the permalink.